I do try to document as faithfully as I can the vicissitudes of life on our hill and the camera hopefully lends an air of authenticity to the whole proceedings. Mere photographs can never capture the savage ferocity of our katabatic winds and the courage of our little wooden house as it shudders and shakes with each fresh onslaught. The camera can’t tell us about the intoxicating smell of the orange blossom, the buzzing of the garrigue (scrubland) alive with foraging bees, the terror of inexplicable nocturnal noises, the pathetic mewing of the mighty golden eagles. That’s, hopefully, where my memory can help provide the narrative to fill in the gaps. It occurs to me that I am slowly becoming more accepting of death out here in the campo. After all, it’s a natural thing; “in the midst of life we are in death”. And as new life springs up everywhere, especially at this time of year, there has been a lot of death around us recently – the sad demise of the bees being a biggie. Presumably thousands of ants were squashed and eaten by the jabalí (boar), and although we try not to, we must be stepping on loads of insects each and every day. 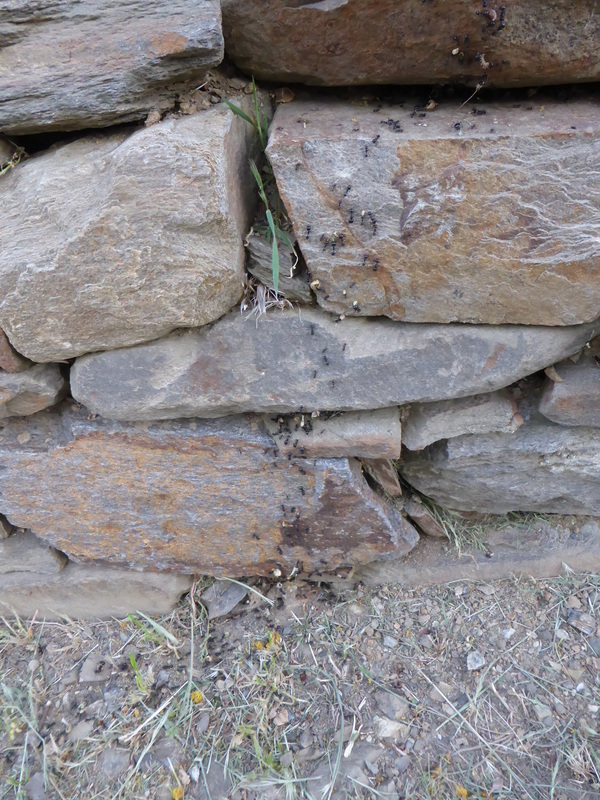 Many of the ants in this picture must have contributed to their own demise as they had, rather inadvisably, sited their nest halfway up a stone wall a metre high. The trail of glistening ant bodies tracked its way ever upwards, stone by stone face – probably the ant equivalent of climbing the Matterhorn. Unfortunately, it did appear that more were dropping off than actually managed to make it to the nest, still clutching their precious trophies of grass and leaves. How many died during this perilous expedition and how many lived to climb again was difficult for us to calculate. When I was writing the blog about my time alone here a week or so ago, I quite forgot to mention a death. Deryk, our nearest and dearest neighbour, wanted Ricardo’s phone number which unfortunately I couldn’t find. He explained that there was a dead goat in the track opposite their gates. 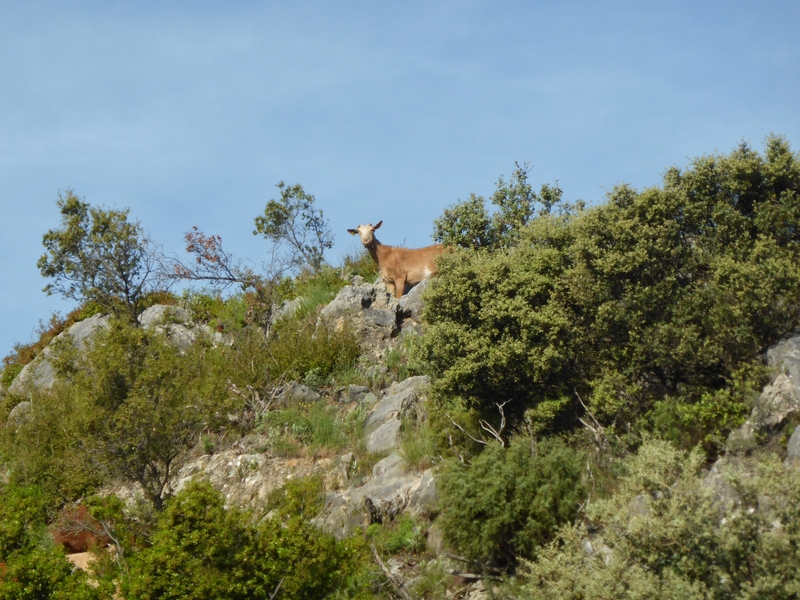 Ricardo, since his bump on the head, has become even less thorough in escorting his herd, preferring a more binoculars-and-vehicle approach to trying to locate his goats after they’ve been for their afternoon perambulation. Last year we’d been to get some spring water and we came across this tender scene of a mother having very recently given birth. There appeared to be a difficulty with the baby getting milk, and it was weakly bleating a protest. Joe got out of the car and tried to express some milk from the exhausted mother’s teats, but she was dry as a bone. We then drove to Ricardo’s house and eventually found him in the village bar. He’d obviously seen it all before, and it was dusk before we saw his vehicle come along the track. It seemed our intervention counted for very little, or perhaps we were over-reacting? Back to the saga of the dead goat. Over a few days I’d been noticing a small group of three chestnut brown goats as they hung around the track, grazing and sunning themselves before moving on. Then I heard their bells from the side of our hill and then they were gone again. Finally – and very unusually given our isolated position – one sunny afternoon as I hung out the washing I had the uncanny feeling that I was being watched. I looked up and saw this cheeky little girl regarding me with some interest from her vantage point, her companions having presumably long since departed. The day before Joe went back to the UK, a frantic little white goat had somehow got herself onto our land, and was running up and down our fence, magnetically attracted to a little kid who was doing the same along the side pathway. 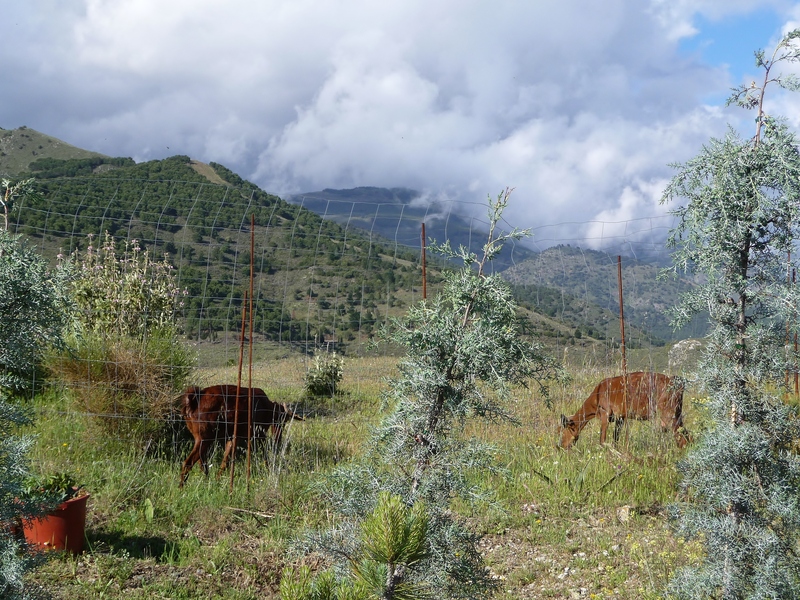 She became even more anxious when her kid decided to follow the rest of the herd down through the encinas and back home. We eventually managed to get her towards the front gates, but she then did a kamikaze leap downwards over the top of the metre and a half high fence. So which of these three or four stray goats would be the candidate for the dead body? Several days after I spoke to Deryk, I got my answer. It was one of the lovely chestnut brown ones. The poor little love was lying there looking reasonably peaceful, with her back legs slightly nibbled. It didn’t surprise me that Ricardo hadn’t taken her away, although I’d seen him with his goats there the last two evenings. On my return from the coast five hours later a sorry sight greeted me. 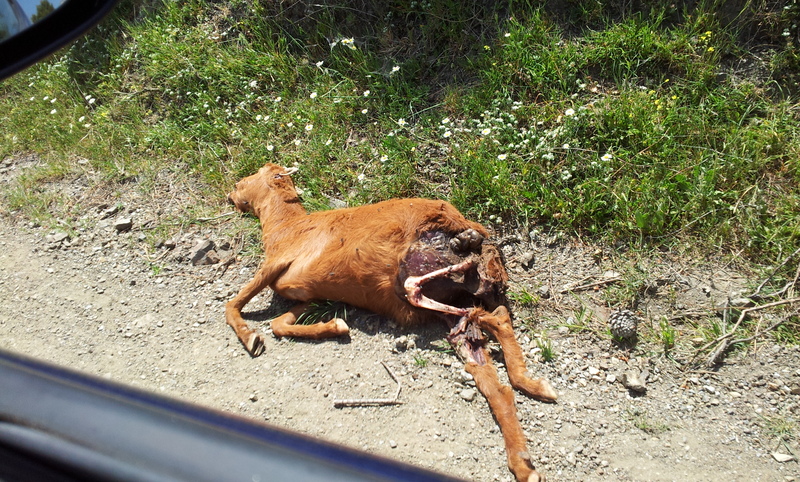 The flies were buzzing, and something much larger had managed to disembowel her and chew on her back legs. She was finally carted away; no doubt thrown to the dogs. The other goat herder, Giraldo is a different kettle of fish. With his cap firmly on his head, stick in hand, he walks miles each day. We drove past him yesterday and almost didn’t see him. 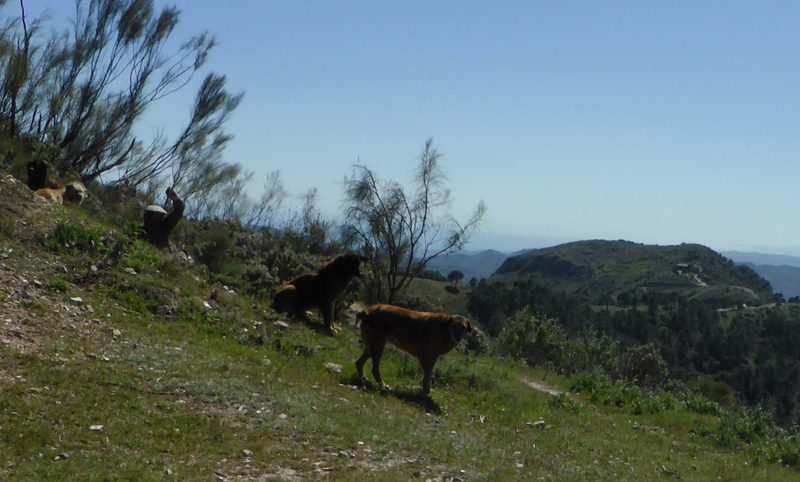 He was reclining against a rock watching his flock, ever vigilant, his three faithful Andalusian sheepdogs by his side. Here he is casually waving for the camera, with our hill in the background! And I’m pleased to report that this little chap definitely managed to live to fight another day. 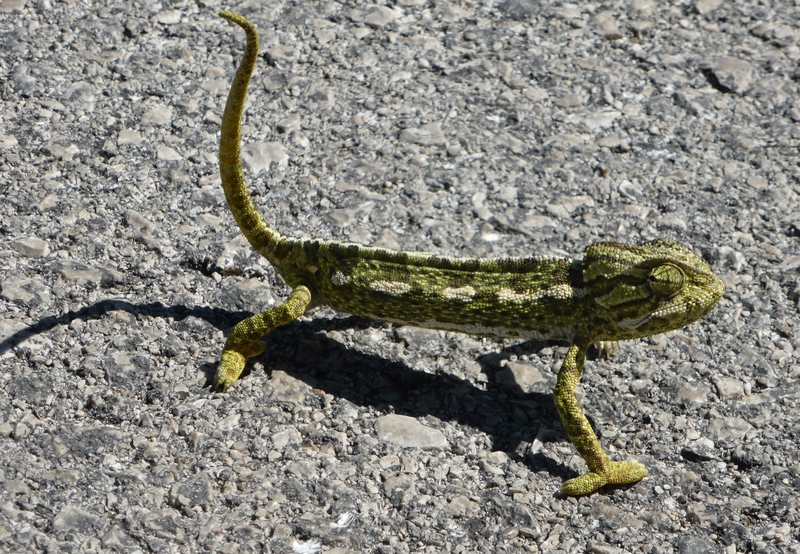 We were driving along in the Nissan, having one of our many glad-to-be-alive-chats, when we spied this green thing – the first chameleon we’ve ever seen! It looked as though it was dancing, rocking forwards and backwards with front and back legs alternately raised. As if to say, “I’m not sure whether I should be crossing this road with that bloody great blue vehicle coming towards me”. But before it could make a decision, Joe had scooped it up, turned it round and it scurried off into the bushes. Ah, bless!